Valencia is famous for its paella. This is where Spain’s most iconic dish was first fried by the marshes of Albufera lake (although originally its main ingredients were rabbit, chicken and snails and not seafood, which is the type of paella favoured by most travellers today). 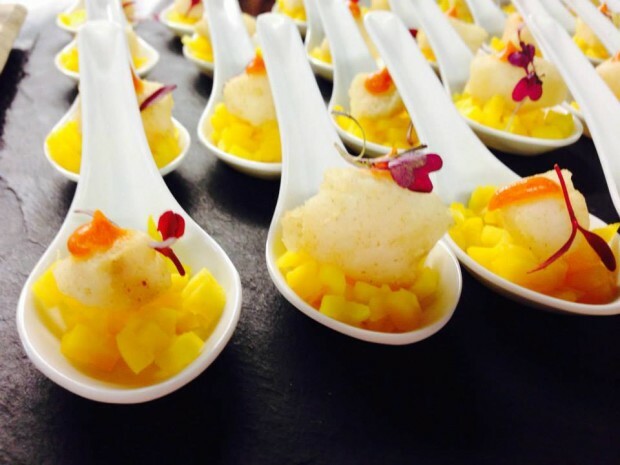 Naturally you can still find the best rice dishes in Spain here in Valencia, but as local chef Bernd Knoller recently put it “Valencia has finally broken free of the slavery of paella” allowing the city’s gastronomic scene to flourish. With Europe’s biggest food market in the centre of town, the Mediterranean sea lapping the city’s shores and a rapid rise in the quality of wines produced in the region, a new wave of innovating chefs have had all the ingredients they need at their disposal to fuel this new culinary epoque. It’s no co-incidence then that in recent years five distinct Valencian restaurants have earned Michelin stars, offering diners an assurance of quality and creativity, whilst a new generation of gastro bars are putting the fun back in eating out, always at a very affordable price. All six of The Travel Mob bloggers visited Valencia at different points over this December and January, and of course we took the opportunity to visit some of the most renowned restaurants in town to see what they had to offer. Here is a run down of the best of our eating experiences. What if we told you that, somewhere in Valencia, you could enjoy dishes by a triple-starred Michelin chef for as little as €3 a dish? That’s the rather irresistible carrot that Mercat Bar dangles before the city’s food lovers, as it was none other than Quique Dacosta who opened this gastro bar with the intention of making great food casual, fun and accessible. 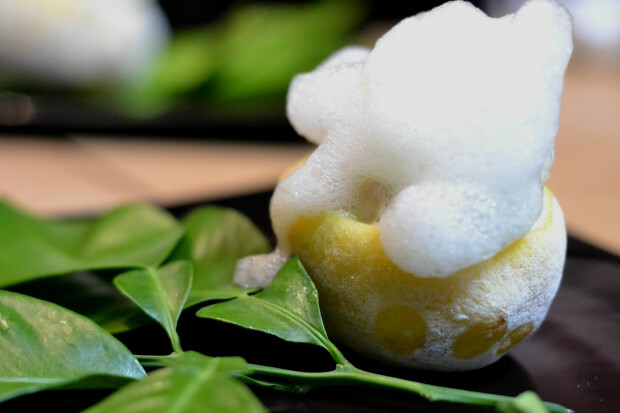 Dacosta has been running his eponymous restaurant down the road in Denia since the late 90s, winning his third Michelin star in 2012, so it almost beggars belief that one can sample many of his favourite dishes in a tapas bar, the cheapest of which – a delicious Parmesan cream airbag and pancetta – vends at just €2.5. That certainly a lot easier to swallow than the €185 that a seat at his Denia restaurant commands. Amongst the many surprising tapas on offer, many of them reinterpreted from global dishes, that I tried were juicy Mexican tacos of pibill pig, lemon fish cerviche, presented with a foam, soft pieces of raw red tuna, marinated in soy sauce, oxtail stew toast (intense!) and a cubalibre of foie gras with hoarfrost lemon. The last is a classic Dacosta dish, although for my personal preferences it was a bit too rich, tasting almost like thick chocolate mousse. Still that’s half the fun of Mercat Bar… trying some of the improbable concoctions on offer and not having to care much about the damage done to the wallet. Review by Duncan Rhodes. Probably my favourite meal of a Valencian visit that included nothing but great meals, Vertical is a Michelin-starred restaurant situated up on the 9th floor of the Confortel Aqua Hotel. Windows for walls offer an unobstructed view over the sparkling lights of the city by night, a vista which you can also enjoy al fresco at their “Sky Bar”, whilst an interior dominated by straight lines and white table clothes creates a formal atmosphere perfect for date night when your aim is to impress. The tasting menu starts with a series of tiny, often surprising morsels organised on wooden trays like chess pieces about to go into battle, my favourite of which is the skinned cherry tomatoes that explode in your mouth to release the flavour of a perfectly concocted Bloody Mary. Next a series of rabbit tacos are served up on a bed of stones in a wooden box. Other memorable moments include a melt-in-your-mouth serving of lamb with airbag and meat reduction that tastes like a pocket size portion of my mother’s Sunday roast, and a pre-dessert of lychee with passion fruit and meringue crumble. The service, from all the staff members is the right balance of cheerful, helpful and unobtrusive with a special word of praise needed for Mario the sommelier whose wine pairings hit the mark as sure as an arrow from Robin Hood’s quiver. Review by Duncan Rhodes. If Casa Montana is a secret, it’s a poorly kept one… this unassuming bar in the up and coming Cabanyal district, out by the beach, is too far from the shore to benefit from any passing trade, relying instead on word of mouth to survive. And the word has spread far and wide, judging by the savvy locals, Scandinavian businessmen and scattering of tourists that say down for a late lunch on the day of my visit. The space, a former sailor’s tavern, will appeal to romantics, with its huge oak wine barrels, art nouveau tiles and antique bull fighting posters, but of course its the food and drink that gets the punters coming in. The dishes are almost rustic in nature, and certainly nothing fancy – highlights include ajo arriero: a simple but delicious garlic and potato puree, and michirones: fat fava beans that have been cooked with meat and spices. The emphasis is on the quality of the ingredients and even some of their bread, tomato and oil with have you licking your lips and relishing the basics of great Spanish cuisine. The wine selection is phenomenal, as you might expect give than the owners make prize-winning organic wine in their nearby bodega. Review by Duncan Rhodes. There’s a members only vibe about this swish restaurant in the Eixample district, which is run by the German chef Bernd Knoller and has carried a Michelin star since 2009. You must pace the corridor first before the dining room opens up at the back, with just a handful of large round tables separated into “booths” by a curtain of fine gauze. 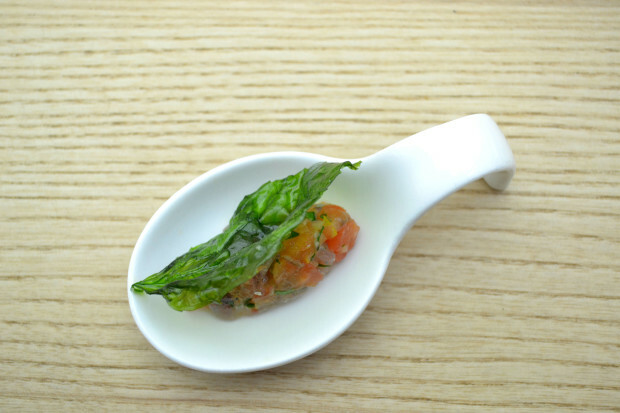 As with most fine dining experiences in Spain Riff has gone down the tasting menu route, which at any rate is more or less an extension of the Spanish tapas culture of multiple small dishes. 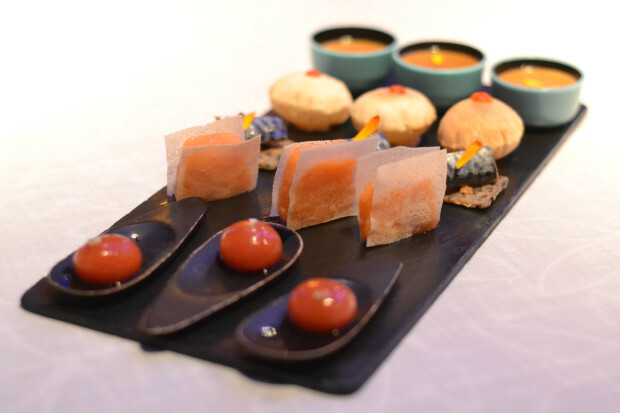 After some posh peanuts, diners are served canapes such as pork and apple on a wafer or dried smoke fish with an almond alioli. I’m more interested however in the Bloody Mary made of tomato water. Unlike the Bloody Mary spheres in Vertical this is an actual drink, with the appearance of cloudy Cava. I’m surprised that something that looks so different can taste the same as its ancestor, although I do miss the viscous texture that one associates with the drink. My tasting notes reveal a dozen more – at least – intriguing dishes, but the winner is clear. The pig’s ear with lentils is cooked 72 hours at 82 degrees in the oven (that’s some prep!) giving this fatty dish a soft and succulent nature with the taste of pork crackling. For dessert chocolate smear with wafer head dress and riccota cheese is paired with a divine Moscatel. Review by Duncan Rhodes. Following a very similar concept to Mercat Bar, Canalla Bistro is one of the city’s much-hyped new gastro bars that has placed Michelin-starred expertise at the disposal of ordinary people. 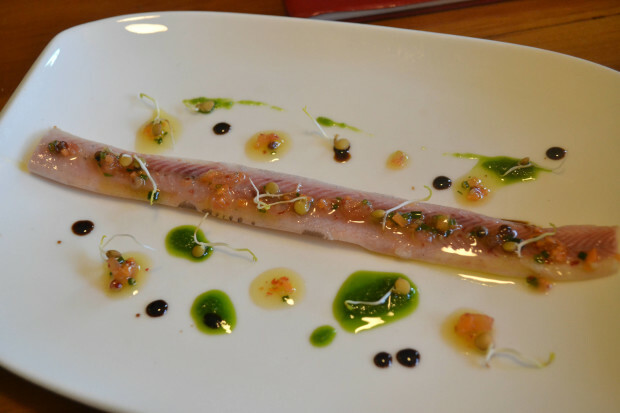 This time is the celebrity chef is Ricard Camarena, and if you can’t afford his lauded flagship restaurant then you almost certainly can afford to tuck into his cuisine just around the corner in this uberhip bistro. The interior is decorated with wooden brick-like panels, matt black furniture and finishes and egg-carton foam glued to the walls, creating a late night bar vibe and the menu consists of classic dishes from around the world, but especially Asia, in tapas form. A Beijing duck nigiri sandwich is a tasty morsel at €3.5 a unit, whilst larger dishes like the New York influenced pastrami sandwich is much more than a mouthful. For every steamed pork meat empanadilla with coconut white sauce and keffir lime there’s an honest to goodness chicken wings with sesame sauce, meaning you can be as adventurous or unfussy as you feel on the night. In the trendy Russafa district, this is a great way to start a night on the tiles. Review by Duncan Rhodes. 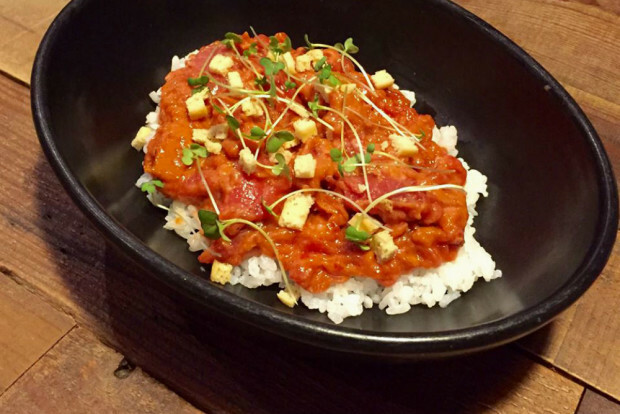 Spicy red tuna tartar with sushi rice (Photo by Canalla Bistro). Set underneath the Hotel Caro, Alma de Temple is undeniably one for aesthetes. This spectacular space was designed by Francesc Rife around the ancient foundations of Valencia’s 12th century Arabic wall and was recently voted by German publication Taschen as one of the most stunning restaurants on the world. But Alma de Temple is more than just a looker and dishes like dishes like sirloin steak with cream of Stilton cheese and mustard have helped earn it a Michelin recommendation. The service is first rate and if you’re yet to try the famous Agua de Valencia concoction you’ll find it on their cocktail menu. Modern treats enjoyed in an ancient environs (Photo by Alma de Temple). Our full range of Valencia travel tips and stories will be published on TheTravelMob.com soon, however in the meantime you can see plenty of photos and tips by following the hashtag #VivaValencia. So you’re interested in travelling to Ljubljana, but you haven’t quite made your mind up yet to book those flights? Or maybe you’ve already printed your boarding pass and squeezed a week’s worth of clothes into your hand luggage bag, but now you’re looking for some guidance? In either case you’re on the right page. As well as writing over 30 stories on all aspects of Ljubljana, from the fine dining scene to the street art, and recording these videos (so you can get a sneak preview of the Slovenian capital for yourself! 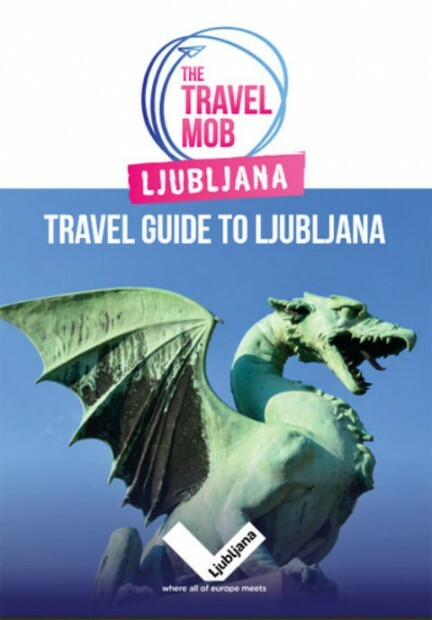 ), the diverse members of The Travel Mob also wanted to offer a little present to any would-be Ljubljana lovers out there. In our free e-book to Ljubljana, each of the Mobsters has reviewed their favourite six hang outs in the city. From unmissable sights like the castle, Tivoli park and the City Museum, to avant garde galleries, the flea market and a range of hip bars, cafes and restaurants, you’ll be spoiled for choice whether you’re into culture or the more epicurean pleasures! The e-book comes with practical advice on getting there, accommodation and tours, as well as a story about Slovenian cuisine to get your mouth watering. You can download it here for printing or perusal, or if you prefer access the same info online.